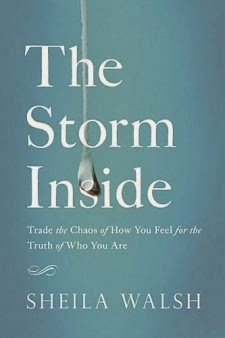 Today, Sheila Walsh's newest book has been released - The Storm Inside: Trade the Chaos of How You Feel for the Truth of Who You Are. I was blessed to get an early copy to review. I first became a fan of Sheila Walsh in 2011 when I attended the Women of Faith Conference in Atlanta, Georgia. Read about my experience here. She quickly became one of my favorite speakers and over the years, one of my favorite authors. "Women feel the storm activity all around. We find ourselves teetering somewhere between everyday chaos and crisis. - Redefine your failures as a new beginning instead of an end. - Replace the words always and never in your life with positive declarations of hope. - Know with confidence how to help a friend in chaos or crisis." Truly at this point in my life, just about every aspect feels like chaos. At least the big ones anyway, and my feelings are the main reason why I can't seem to make any meaningful progress. At times, I'm just stuck. Stuck with what I'm feeling inside and the person I have to show on the outside. I long for the day that I can just be free. Reading The Storm Inside: Trade the Chaos of How You Feel for the Truth of Who You Are has touched the deepest parts of my hurt and have shed light on the path to restoration. Sheila has a way of engaging the reader as a loved friend, never judging and always extending compassion in your hurt. There is no legalism just a heart a heart based on scripture and personal experience. My overall opinion of the book is that it is a great read. It's easy to get hooked into the conversation from the author. Each chapter addresses the storm topic and ends with a section on how to "stand through your storm" which included a few tips and a prayer. This is in no way a one-and-done book nor is our struggle. This is a book to read over and over. This would be a great gift to someone you know is struggling. In addition to the book, there is also a book study and devotional available in stores and online. Disclosure: I received a copy of the book without charge for the purpose of this review. All opinions contained herein are my personal opinions.